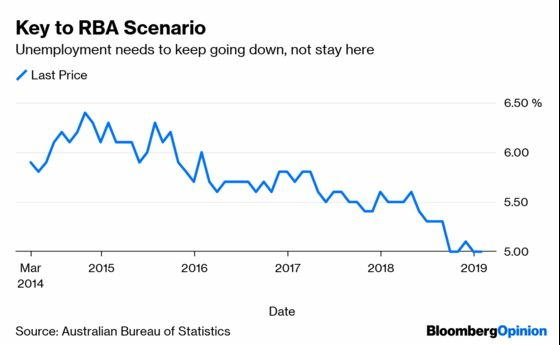 (Bloomberg Opinion) -- For a central bank at pains to stress neutrality, the Reserve Bank of Australia may not be far away from cutting interest rates. Minutes from the RBA board's March 5 meeting attest to the load being carried by the labor market and consumers. The idea is that low unemployment will translate into higher wages, enabling the consumer to step up despite the drop in home values. There’s a lot riding on that formula. Not much else looks terribly promising over the short-to-medium term. How much faith does the RBA have in this scenario, and wouldn't officials want to take out a little insurance? It might not take much of a deterioration for that to happen. After a long stretch in limbo, monetary policy Down Under has become very interesting this year. First, the RBA jettisoned its tightening bias and then professed agnosticism about whether the next rate move would be up or down. Then came numbers showing the economy slowed quite a bit in the final three months of 2018. The global picture darkened and, domestically, house prices extended their slide. Further reduction in spare capacity underpinned the forecast of a gradual pick-up in wage pressures and inflation. Given this, members agreed that developments in the labour market were particularly important. Members noted that the sustained low level of interest rates over recent years had been supporting economic activity and had allowed for gradual progress to be made in reducing the unemployment rate and returning inflation towards the midpoint of the target. The implication is that if low rates got you a strong jobs market, then any labor fragility or change in the outlook would justify even lower rates. In other words, it might not require a dramatic change. Consumer spending, which has supported that famous three-decade expansion in Australia, can only do so much. Even here the outlook is characterized by “uncertainty,” the minutes say. The central bank is wrestling with why relatively robust levels of hiring accompanied the slowdown in activity at the end of last year. This “tension,” as the RBA calls it, isn't unique to Australia. The minutes repeat the central bank's line that there's no strong case for a near-term move in rates. That stance is predicated on something that gets less airtime: “reasonable expectations” that the jobless rate will move lower and inflation move up. Stasis on rates isn't an iron-clad commitment. There is subjectivity to it. The year is only a few months old, but 2019 has seen a dramatic pivot among the world's monetary guardians. That poses the question: Is Australia all that different? Chances are the RBA will buy some insurance. The minutes don't so much make the case for it, as remind us of the likelihood.